Let’s celebrate a little Sunshine Blogging. Woo hoo! 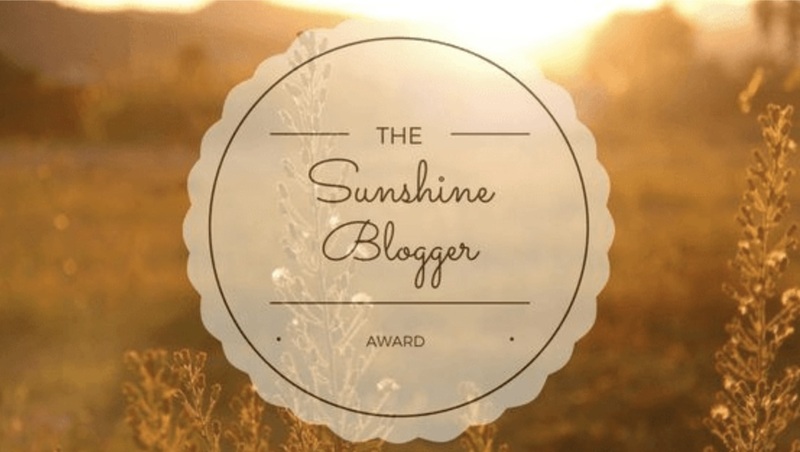 Cadie over at Cadie’s Corner did me the extraordinary honor of nominating me for the Sunshine Blogger award. I mean awards are nice and all, but this one is given to blogs are are inspiring, positive, and creative. How awesome is that?? Thanks, Cadie. That is high praise indeed. What are you currently reading? Does my Christmas shopping list count? That and my grocery list are getting a lot of face time right now, but I’m guess Cadie means “actual” reading so that would be Loving What Is by Byron Katie. What is your biggest turn off? Any kind of tobacco use, but particularly smoking. Cigarette smoke gives me a headache. The remnants of cigarette smoke give me a headache. The wisp of the remnants of cigarette smoke gives me a headache. Smoking is a deal breaker. Which do you prefer: chocolate or fruit flavored candies? Chocolate for sure. Who is your favorite person? Yeah, I can’t answer that. Does anyone have one single favorite person? (Wait, they do? Really??) Mine’s more of a moving target depending on my mood but we can safely say BrightSide and Bee are hanging out in that arena. Sista-friend and gem, too. What is your favorite blog post that you’ve written and why? Let’s go with “sugar honey iced tea” in March 2016. I don’t know that it’s my favorite ever but I sure did have fun writing it, and if I can’t make fun of my utterly inept crafting skills then what am I even doing here? Where do you see yourself in 10 years? Congratulations, Cadie, this question just stopped my heart. In a decade I will have two kids in their twenties and that doesn’t even seem possible so whatever. LOFTY ANSWER: I’ll be happy and healthy, well versed in delectable gluten free cooking and on a regular exercise regimen, volunteering for a few issues close to my heart, and maybe I’ll even buckle down enough to get something published. REGULAR ANSWER: I’ll be writing (because words are my air) and eating (because food is my food) and hanging with BrightSide as we figure out what it looks like to be adults with grown kids who’ve moved out of the house and thank you sweet Jesus there will not be any Fortnite shouts rolling through my family room while I’m streaming Netflix AMEN. How many pets do you have, what are they and what are their names? We’re a three pet household unless you count the bird picnics we host outside. In that case you can add another 3,652 to that list. We love on a golden retriever named Gracie, a yellow lab mix named Phoebe, and a kitten named Mia. How do you plan what you will write about? At the beginning of each month I set up a new blog calendar in Numbers, cutting and pasting in weekly topics and leaving days open for free writing. That’s how I plan out topics and track my publishing. I also keep an RFTM note in the cloud that I can access on any of my devices for ideas, links to resources, and my scribbled brainstorms from stoplights around town. Those two tools help me organize the blog. I’m gonna break the first part of rule #3 (screw you, rule number three!!) and invite anyone reading this to join in the fun. If you’d like to participate in being a Sunshine Blogger – and really, who doesn’t? – these are my questions for you. Remember to tag me in your post so I can check out your answers. Happy Thursday! Close your eyes and picture yourself – what age are you? What’s the weirdest thing we’ll find in the bottom of your purse/tucked in the back of your wallet? You show up for an appointment and are told it will be ten minutes. There are chairs but no reading material for waiting. What do you do for those ten minutes? Are you a run-into-the-burning-building or a call-911-and-take-care-of-the-people-outside sort of person? What’s your sharpest memory from childhood? How old are you in it? You can fill ten strangers’ gas tanks or pay for ten strangers’ checkout at the grocery store. Which do you choose and why? How do you deal with privacy issues (for you, for your friends and family) on your blog? Tell us about someone who knocked your socks off this year. Who are they and what made them special? Name something you’ll never do again, something you wish you could try, and something you’ve done that you wish you could do all the time. Next Next post: small bites: But what about black-on-black crime? Loved your post. I am going to take up the offer to answer your Unique questions. Yay! I look forward to reading your answers. Happy Friday! Thank you, Cadie. Hope you have a great day! !